Here comes the high time. Now, you have to keep your mindset calm for JEE Advanced. Just pick some important topics which you are good at. Avoid any new or untouched topic. Revise your learnt topics thoroughly. The best way to utilize this time is by practicing previous year JEE questions. Just pick up a question bank of 30-35 years. Start solving it chapter wise (except last 3 years). Solving chapter wise will help you judge your weak points in each topic and will help you fix it faster. Make a list of common mistakes you are doing while solving previous year questions. Just go through your mistakes again and again until you are sure you have fixed it and won’t repeat it on the doomsday. Solve the last 3 years paper in the same exam like pattern. This will also make you confident about your time management skills. Apart from this, you can also go for other model papers from authentic sources. 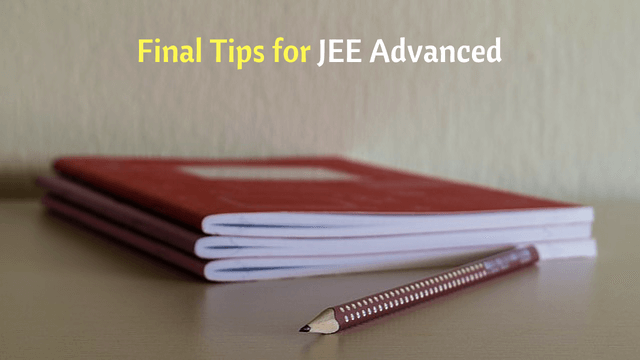 You should avoid solving such papers which are either easier or tougher from the actual JEE level. This will either give you a false impression of yourself or the exam. Do not get panic if you are stuck in a problem. Also, do not give too much time to a particular problem if you’re stuck in it. Just leave it for then and give it a try next day or finally try to understand it by seeing the solution. Give proper time to all the three parts (Physics, Chemistry and Mathematics). In the last 3-4 days before JEE Advanced, focus more on those parts which are memory based e.g. Salt analysis chart in chemistry. Take proper sleep. Ensure physical well being. Have full confidence in yourself. Believe in yourself. You have done enough endeavor for years to achieve the feat and you’ll surely make it. Waiting for you to join the league! Piyush is an undergraduate pursuing Computer Science & Engineering at IIT Guwahati. He loves to share experiences about JEE, passionate about science and technology, enthusiastic learner, and loves to explore new things.